Two-Dimensional Grain Boundaries By Design | Grain boundaries are borders that separate crystals of distinct orientations and are generally considered as inevitable by-products of crystalline regions nucleating at different locations during growth. The MIP team has predicted how grain boundaries in two-dimensional crystals can form within a single grain by introducing bumps onto the substrate – the “floor” on which a 2D crystal grows. A 2D crystal warps itself as growth advances past a bump, so much that it eventually runs into itself at an angle determined by steepness of the bump. Although aesthetically jarring, grain boundaries can endow 2D crystals with desirable mechanical, electronic, and magnetic properties. The predicted topographic control of grain boundaries offers the opportunity to engineer grain boundaries into 2D crystals with atomic-scale control. Finite-length grain boundaries and their topographic control using curved substrates are predicted from accurate empirical forcefield calculations. The study expands the scope and generalize the concept of grain boundaries, introducing a method of controlling the density and detailed geometry of grain boundaries that is general to all 2D materials. Access to high-performance computing resources capable of modeling thousands of atoms. Y. Wang and V. H. Crespi, “Theory of Finite-Length Grain Boundaries of Controlled Misfit Angle in Two-Dimensional Materials”, Nano Lett. 17, 5297 (2017). Designing Grain Boundaries. Laying down square tiles is shown to start off perfectly on the surface of a cone but ends up with an inevitable jagged border across which the two tiles orient incompatibly. 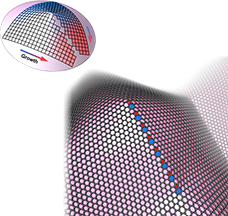 Similarly, the right panel shows the formation of a finite-length grain boundary in graphene when grown on top of a conical surface.